To clarify the questions raised by it’s original FAQ (“Frequently Asked Questions”), the New Jersey Department of Health has issued an Updated FAQ regarding the new rules and regulations with regard to the New Jersey State Sanitary Code, Chapter IX – Public Recreational Bathing, N.J.A.C. 8:26. 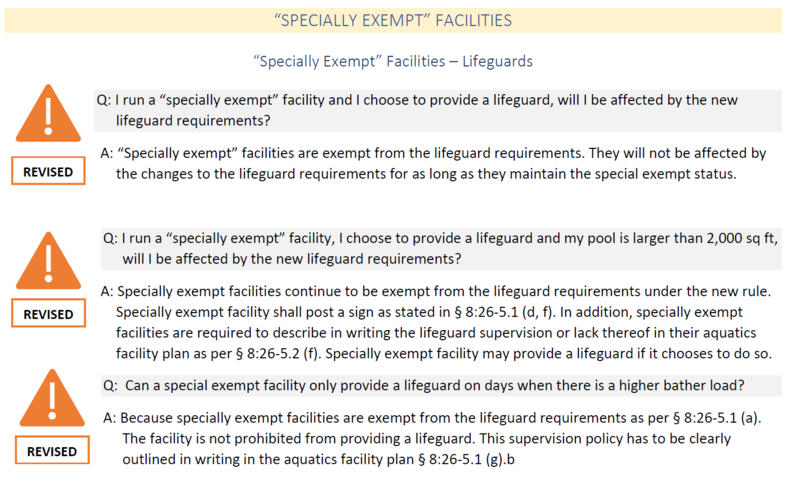 The Updated FAQ clarifies the new lifeguard requirements specifically with respect to “specially exempt” facilities (see picture above). You can review the UPDATED Department of Health’s FAQ by clicking here. 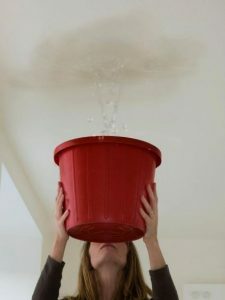 To address some of many, many questions that have arisen regarding the new rules and regulations updating the New Jersey State Sanitary Code, Chapter IX – Public Recreational Bathing, N.J.A.C. 8:26, the New Jersey Department of Health has recently published a FAQ (“Frequently Asked Questions”). 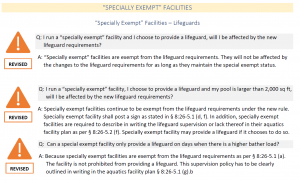 The FAQ covers questions involving the new lifeguard requirements, “specially exempt” facilities, water sampling, and operational requirements. You can review the Department of Health’s FAQ by clicking here. In order to help community associations understand and plan for implementation of these new rules and regulations, Hill Wallack LLP will be hosting a free webinar on this topic with representatives from American Pool at 12 p.m. (noon) on February 20, 2018. If you are interested in registering for this webinar, please click here. Without much publicity or fanfare, new rules and regulations updating the New Jersey State Sanitary Code, Chapter IX – Public Recreational Bathing, N.J.A.C. 8:26, became effective on January 16, 2018. If you live in a community association with a pool, these new rules and regulations will have a significant impact on opening and operating your pool this coming season. These are the most sweeping and important changes that have been made in a number of years, so managers and board members will need to pay close attention. On August 12, 2015, the New Jersey Supreme Court issued a decision in Qian v. Toll Brothers Inc., which determined that community associations are not entitled to immunity from claims of personal injury sustained on private sidewalks that comprise part of an association’s common property. In deciding Qian, the Court made clear that its 2011 decision in Luchejko v. City of Hoboken, which held that associations were immune from liability for the failure to adequately clear snow and ice from a public sidewalks, does not apply in the context of an association’s private, common property. Although the result is not surprising based on the long-standing common law concerning tort liability, it does clarify the distinction between the potential liability of a community associations for private versus public sidewalks. As discussed in a previous blog post, in Qian a resident in an adult residential community was injured after a slip and fall on ice following a winter storm. Qian sued the association, its developer (who controlled the board), its managing agent and the contractor responsible for snow and ice removal. The Trial Court dismissed the claims against the association, developer and managing agent based in part on the decision in Luchejko. On March 16, 2015, the New Jersey Supreme Court will hear argument on Qian v. Toll Brothers Inc. to answer the question of whether a community association can be found liable for the failure to adequately clear snow and ice from its common sidewalks.